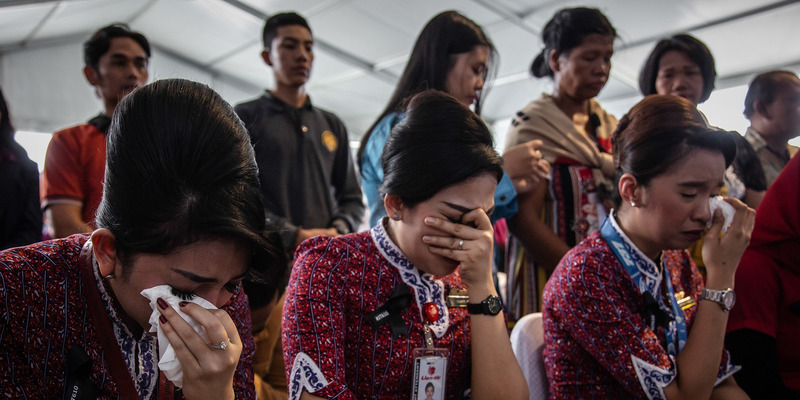 Ulet Ifansasti/Getty ImagesFamilies and colleagues of victims of Lion Air flight JT 610 cry on deck of Indonesian Navy ship KRI Banjarmasin during visit and pray at the site of the crash on November 6, 2018 in Karawang, Indonesia. Hello! Here’s everything you need to know on Wednesday. 1. Black Box data has provided a glimpse inside the cockpit of Indonesia’s doomed Lion Air flight JT610 in moments before 2018’s worst air disaster.The pilots endured a prolonged battle with a flight system gone rogue, intent on making the jetliner nosedive, reports suggest. 2. “Facebook has a black people problem.”A former employee has written a 2,500-word memo to his colleagues detailing what he perceives as just a few of the problems at the social-media giant. 3. President Donald Trump claims job losses at General Motors are the Federal Reserve’s fault.Trump has blamed Fed chairman Jerome Powell for layoffs at General Motors as well as the stock market’s recent wobbles. 4. Apple is having its worst month since the financial crisis a decade ago.Here are five reasons why and a bonus reason why it doesn’t matter. 5. Climate scientists are roasting Trump over his cool reaction to climate change report.Trump said he does not believe the critical report that his administration produced, and scientists have much to say about this. 6. Russia has broadcast on state TV the confessions of “provocative” Ukrainian sailors.The bizarre confessions are the latest twist in a Crimean crisis that looks increasingly difficult to defuse. 8.The very tense Mississippi runoff has produced a winner, at last.Voters chose GOP Cindy Hyde-Smith to a full Senate term, ending a fraught runoff against her Democratic challenger Mike Espy. 9. NASA delivered an $US850 million hammer to the red planet.This is why it could uncover clues to an outstanding mystery in our solar system. 10.In a special call out for a special cow. Just imagine what NASA could do with Knickers, the cow the size of a moon.